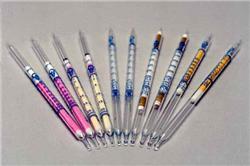 Gastec 32D Hydrogen Peroxide (Dosimeter Tube) Detector Tubes. Detection Range: 0.5-40 ppm. 10 measuring tubes per box.